...well it's proven to be quite the whirlwind over the pass few months. We'll just say; many personal "life events" have come into play. The CD! Production went GREAT. Only glitch was the need to re-mix one of the tracks so it could withstand the post-production compression and maintain it's quality. 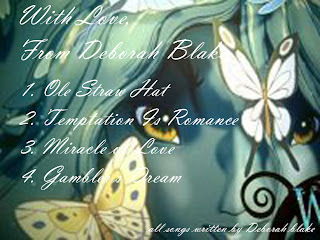 I Should receive the final this week and then I'll be able to push forward with the release and promo of the 4 track EP. I've been working on developing my distribution plan and redesigning my website; doing my best to remain as independent as possible. All in all, I have to say I'm quite pleased. I'll link the CD photo as soon as I get my last track back and they are all released! The DBZG Band: Not a whole bunch of new news here for a change. We had a few really fun gigs come our way, played a couple new "Dives=Sports Bars", made a load of new friends, said good bye to a few, and are looking forward to whose in our future. Still looking for our "permanent" guitarist however. It's proven difficult to move forward with originals while continuing to book club work. It seems to create a cycle of CYA for the next gig with the expected covers, delaying my spending time writing and embellishing originals. Really gotta take a break from the club rat race and get back on track. Our recent run with Reuben Vigil (awesome local guitarist) since Feb 2013, has evidently run it's course. Seems our scheduling has begun to collide causing scheduling conflicts. With his own band, open jams, and guest appearances Reuben maintains a pretty full schedule and DBZG continuing to get quite a number of recent gigs, well it was bound to present a challenge. Mike Keene is still enjoying his wondering mistral status but, thankfully, managed to fit in a few "CYA" guest spots with us in Reuben's absence on a couple gigs; The Coyote Bar & Grill (soon to schedule again, just got bumped due to double booking) and Pal Joey's which we'll be returning to in Nov 2013. Thanks Mike! There will, for sure, be a couple new comers this year as we steer the DBZG band back to originals. This may slow down available club bookings but our plan is to create some of our own shows in private venues where we can introduce new material, new bands and a new way to enjoy the music! Having Mike McGinty join in on keys for a few gigs late this year was a real pleasure and by all means check him out on "Gambler's Dream" one of the new tracks due for release. The gents from ZG's current lineup; Art McAvoy-drums, Jeff Stedman-bass, Lenny Locken-guitar, Reuben Vigil-guitar and Mike McGinty-keyboards are all featured on this track. Awesome job! Unfortunately Mike is relocating to Oregon in Sept.
What's Next? Well just as Mike McGinty (keyboards) offered up the news he's relocating we were introduced to Jack Mathews (keyboardist from Cactus 5) who was baptized by fire when DBZG was called on to cover a last minute gig for Cactus 5 requiring him to ramp up on his own and join the fun without any real introduction. Fortunately for us he did a great job and the gig went off without a glitch. We'll no doubt be doing some more work with him as we continue to march. New Project: Well if you've known me a significant while you know my roots are in country so you won't be surprised with my desire to answer the call to re-form a traditional honkytonk band. Of course a few of my "regulars" will be on board but I'll be hand pickin' some swingin' boogie-woogie and honkytonkin' playboys. Steel guitar, Dobro, fiddle, upright bass, harmonica, maybe even a washboard, lol. It will we a total flashback.